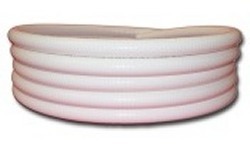 This page contains both our standard 1/2-inch flexible PVC pipes and our NEW EZ-Flow 1/2-inch thin wall PVC pipes. All are Sch 40 sized flexible pvc pipe. (Fits both Sch 40 and Sch 80 pipe fittings. )If you require this product with a slightly larger diameter, check out our selection of 3/4" thin wall PVC pipes. 1/2" FlexPVC® Flexible PVC Pipe .840" .60" 100 psi 400 psi 2" 28"
1/2" EZ-Flow Flexible PVC Pipe .840" .622" 60 psi 355 psi 4.5" 28"
Read about our LIFETIME LIMITED WARRANTY! 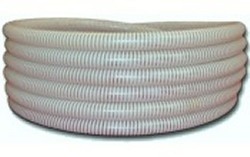 This flexible PVC tubing is MADE IN THE USA,, not like the imported junk that will spring holes in a couple of years.